I make clothing for local plays, everyday wear, and for my friend’s kids. I am constantly making big, frilly dresses and strange looking costumes with lace, silk, velvet, and other materials. By the time I’m done putting the finishing touches on everything, I am left with a big, wrinkled mess. Of course I have to get them pressed and looking great before I give them away. I used to resort to steaming clothing in the bathroom while I showered. The iron that I had at the time would burn clothing or not get them pressed well enough. The Panasonic NI-S300TR solved all of my problems. No longer am I left with wet, wrinkled clothing or burnt edges. This iron will adjust to just about any temperature between 176 and 392 degrees (Fahrenheit). It also heats up very quickly. I can iron delicate materials at a low temperature and then turn up the temperature and can soon iron the rest of the item at a higher temperature. The amount of steam is adjustable, too. If I need to use the clothing soon, I can set it to no or low steam. It will take a little longer to get it perfectly flat, but it is worth the extra effort. Speaking of effort, the extra weight on this iron makes ironing so much easier. It does most of the work for me! 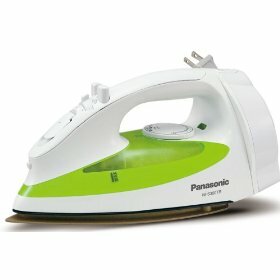 I don’t have to put much elbow grease into ironing my clothing with the Panasonic NI-S300TR. The iron is not too heavy to handle, even for the weakest person. However, it gives just enough extra weight to make ironing easy. Also, for anyone who is as forgetful as I am, this iron will turn off automatically. If the iron is standing straight up, it will give you ten minutes before it shuts itself off. However, if it’s left on its side or on its soleplate and isn’t being moved, it will shut off after sixty seconds. This is great! No more rushing home because you think you left the iron on!